Pteranodon was a large pterosaur from the Upper Cretaceous period. About 1200 partial skeletons have been found, more than any other pterosaur. It lived in the area of the Western Interior Seaway. Fossil Pteranodon have been found in Kansas, Alabama, Nebraska, Wyoming, and South Dakota. With its wings open it was up to 6.25 meters across. 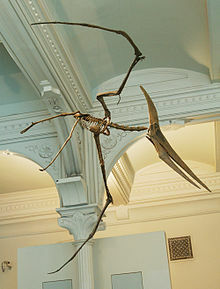 Pteranodon might have lived much like an albatross, spending a lot of time over the ocean, looking for fish. It had no teeth in its long mouth, and it had a small pouch like a pelican at the back of its jaw. Pteranodon had a big crest at the back of its head. Pteranodon longiceps had a straight crest that went backwards, and Pteranodon sternbergi had a bigger, flatter crest that went upward. Pteranodon lived mainly on offshore rookeries. Most Pteranodon fossils are found where, at the time, they were hundreds of kilometres from the coastline. They certainly fed on fish. Fossilized fish bones have been found in the stomach area of one Pteranodon. Other specimens have fragments of fish scales and vertebrae near the torso. Females of both species were smaller than the males, and had small, rounded crests. The crests were probably used in display, though they may have had other functions as well. ↑ Bennett S.C. 2000. Inferring stratigraphic position of fossil vertebrates from the Niobrara Chalk of western Kansas. Current Research in Earth Sciences: Kansas Geological Survey Bulletin, 244 (Part 1): 26 pp. ↑ 2.0 2.1 > Bennett S.C. 1994. The pterosaurs of the Niobrara chalk. The Earth Scientist 11 (1): 22–25. ↑ Bennett S.C. 1994. Taxonomy and systematics of the Late Cretaceous pterosaur Pteranodon (Pterosauria, Pterodactyloida). Occasional Papers of the Natural History Museum, University of Kansas 169: 1–70. ↑ Bennett S.C. 1992. Sexual dimorphism of Pteranodon and other pterosaurs, with comments on cranial crests. Journal of Vertebrate Paleontology 12 (4): 422–434. This page was last changed on 16 May 2018, at 17:43.